As you hunt for property to develop in Washington State, you’ll quickly learn that water-related critical areas – wetlands, streams, and shorelines – are common. Critical areas can add a wrinkle to the home-buying and home-building processes by requiring additional permits and regulatory research, but this should not deter you from buying or building the home of your dreams. The key is informed decision-making. Knowing you have a wetland or a stream opens up a world of possibilities for sustainable design, but it also carries regulatory responsibilities. First, let’s start with a basic question. With what kind of projects should you be aware of critical areas regulations? building a new home or subdivision. Whatever your redevelopment plans, you can rest assured it is possible to build or remodel on land with critical areas. In fact, it occurs regularly throughout the Pacific Northwest (and gives our region a certain charm). Now that you're aware when these regulations apply, let’s talk about what to do next. Critical areas professionals can help you understand your property's developable area and form a plan that is appropriate for your site. 1. When you find a property that you’re interested in and you anticipate making changes or additions to the property in the future, order a critical areas inspection for an expert opinion of the property’s developable area. Sometimes, this step occurs when the prospective buyer is ready to order the home inspection. 2. Call critical areas professionals and convey your desired outcomes for the property. Maybe you wanted to take down the tree in the backyard and start a garden. Or you like the dock, but wish you could add to it. Knowing your plans will help the professional determine what type of reconnaissance is appropriate for your prospective property. If you love a property “as-is” and redevelopment is not anticipated, on-site critical areas may have little to no effect after your new home or property purchase. 3. 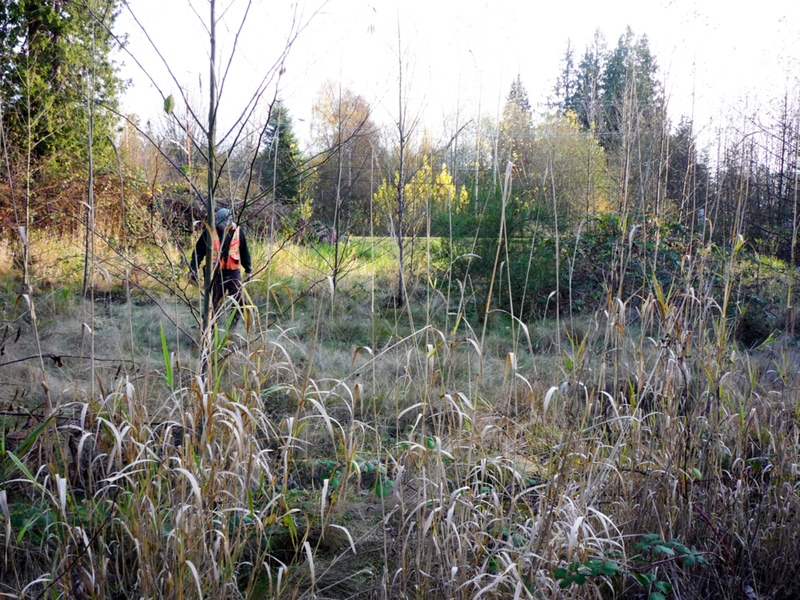 Hire a critical areas professional to conduct a wetland or stream reconnaissance or Ordinary High Water Mark (OHWM) determination. What if the preliminary investigation anticipates little to no critical areas issues? You can proceed with peace of mind regarding your future development project. Note, however, that some agencies may still require the investigation's data forms. What if they find on-site critical areas or buffers? You can make an informed decision to investigate further, look at other properties, or move forward with the purchase, possibly reevaluating your offering price. Sample wetland and stream delineation sketch. If the redevelopment won’t disturb those areas, then you can proceed with buying the property with the confidence that there is a low likelihood of critical areas issues. If a redesign concept is not yet drawn, you can provide the delineation results to your architect or contractor, allowing them to lay out improvements or make adjustments that avoid impacts or minimize the need for mitigation. If the redevelopment shows the potential to impact critical areas, you might choose to pursue other properties, move forward with additional investigation, or modify your development plan. For the highest level of confidence when purchasing a property for redevelopment, you will want a feasibility study. The feasibility study will explore the implications of implementing your planned modifications, development, or redevelopment concept on a specific property. By laying out an approximate timeline and cost estimates for the critical area process, such as permits and mitigation, a feasibility study will help you to make an informed decision about proceeding with property purchase and development. With a feasibility study, you can continue with the purchase with a clear understanding of the road ahead, possibly renegotiating the purchase price. Once I've purchased the property, what are the next steps? You will need a formal critical area study and mitigation plans to submit to jurisdictional agencies for permitting. Mitigation compensates for impacts to critical area buffers by improving the quality of the unimpacted areas. Wetland and stream mitigation typically involves removing weeds and planting native plants. Shoreline mitigation often involves restoring a portion of the shore to a more natural condition that will stabilize the shoreline while improving habitat quality for fish and wildlife. Stream mitigation allowed these North Bend homeowners to develop their new home and driveway. Shoreline mitigation allowed these Lake Washington homeowners to build a large detached garage. By improving their shoreline and landscape with native plantings, they were also able to install a new outdoor storage building, expanded patio, and pool. Contacting a critical areas professional early in the purchase process will produce the best outcome for you as a prospective buyer. If you are considering buying a property on or near a shoreline, wetland, stream, or lake, give us a call. We can provide reliable evaluation and trusted expertise to help you make an informed determination about whether a property is right for you. Newer PostWhat's a Fish Exclusion Plan?